U20 and Kapitan-Leutnant Walther Schwieger. The U20 was built in the Danzig Dockyard in 1913. She was 210 feet long, just 20 feet in the beam and her surface displacement was 650 tons . Submerged, her displacement was 837 tons. She was propelled on the surface by two 850 horsepower Diesel engines. Whilst submerged, two 600 horsepower electric motors took over the job of driving her twin screws. Deck Plans for U20 BundersArchiv/MilitarArchiv Her armament consisted of four 19.7 inch torpedo tubes, two in the bow and two in the stern, plus one 4.1 inch deck gun. She carried a stock of six torpedoes on each patrol. U 20 was modified several times between 1913 and 1916. 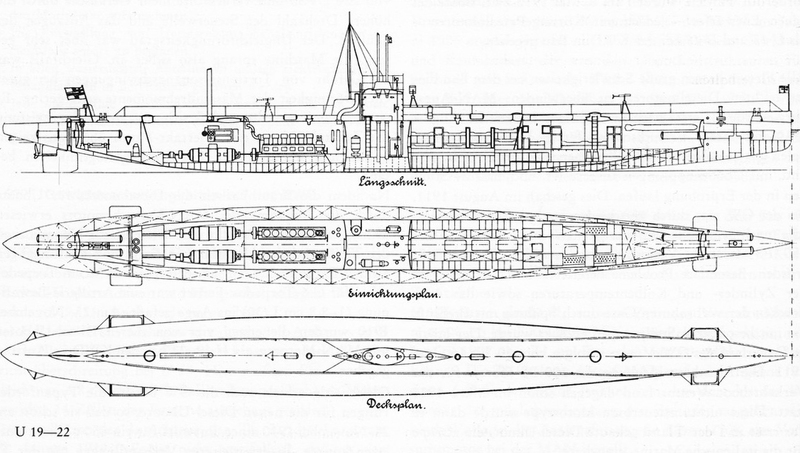 Her forward tubes were replaced with larger ones to accommodate the latest G-type torpedoes, which necessitated the re-profiling of her original perpendicular bow, as seen on the original 1913/14 schematic drawing, to the rounded type shown on the blueprint above, which she closely resembled after the modifications were finished.By the time U 20 was destroyed, she'd also had a ventilation shaft added, just forward of the conning tower, a feature also shown on the 1917 blueprint above. 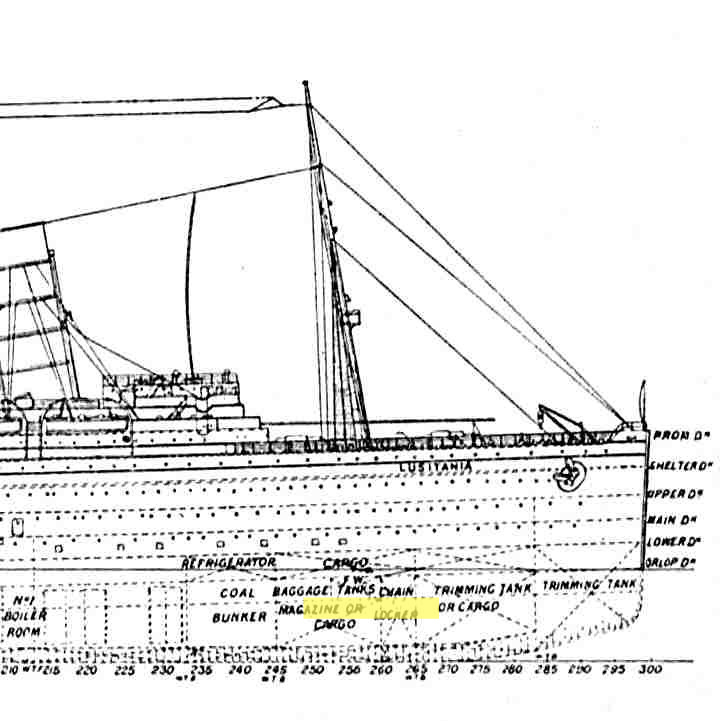 At the time of her loss, U 20's form was pretty much that of the boat shown in the blueprint image above. By the end of 1916, the general layout and specifications for a German U-boat were as those in the blueprint. This is because the Germans had an excellent design in the "Germania" type boats originally developed by Krupp's, so they stuck with it. Apart from size, armament and application, ocean-going German U-boats deviated little from this basic design pattern throughout the Great War. Born on 7th April 1885 to a noble family in Berlin, Walther von Schwieger (he personally disliked the "von" and refrained from using it) entered the Kaiserliche Marine as a Sea Cadet in 1903, at the age of 18 . His initial training took place at the shore-based training establishment Stosch and on 15th April, 1904 he was promoted to the rank of Fahnrich zur See, which was generally speaking, the Kaiserliche Marine's equivalent of the Royal Navy's Midshipman. In 1905, he was sent on a special course at the Marineschule and upon his successful completion of the course, he was posted to a Naval Reserve vessel, the liner Braunschweig. Kapitan-Leutnant Walther Schwieger drawing, by John Gray. He was posted to the Kaiserliche Marine's Torpedo Division in 1906 and in September of that year he was commissioned as a Leutenant zur see after which he served two years as a watch officer on torpedo boats, first the S105 and then G110. On November 10th, 1908 he was promoted to the rank of Oberleutnant zur See and transferred to the light cruiser SMS Stettin. In 1911, he transferred from SMS Stettin to the U-Boote Waffe (U-boat arm). After serving as a Flaggleutnant on U14, Schwieger was promoted to the rank of Kapitan-Leutnant on September 19th, 1914. He took command of U20 at the end of December that year and soon proved to be a popular commander. At the time he infamously sank the Lusitania on May 7th 1915, Schwieger was 30 years old. After the storm of protest caused by the Lusitania disaster, the Kaiser called a halt to unrestricted submarine warfare. This caused a temporary lull in sinkings, though Schwieger and U-20 managed to sink the defensively armed White Star liner Cymric during this period. Unbeknownst to Schwieger, the liner was carrying the body of one of the Lusitania victims home to America at the time. On November 5th, 1916 whilst trying to assist another U-boat, the U20 ran aground in fog off the Danish coast.She resisted all attempts to refloat her and during the attempt to rescue Schwieger and his crew, the German Battleship KronPrinz Wilhelm, which was providing protective screening for the rescue operation, was torpedoed by the British submarine J1. The stranded U20 was therefore hastily blown up using one of her own torpedoes, to prevent her from falling into enemy hands. KronPrinz Wilhelm limped back to base, only to end her days at the bottom of Scapa Flow, in Scotland, when the interned German warships scuttled themselves in a last great act of defiance in 1919. The Danish government eventually removed the wreck of U20 some years later, as she was a hazard to navigation. The remains of U-20 are now a static display in Denmark, open to the public. After U20 was lost, Schwieger was given command of the slightly larger U88 on April 7th, 1917 and on 30th July 1917, he was awarded Germany's highest decoration for gallantry; the "Pour Le Merite" medal, or "Blue Max" as it was more popularly known, in recognition of his having sunk a total of 190,000 tons of allied shipping. He was the 8th U-boat commander to receive this covetted award. The citation for his award did not mention his largest victim; the Lusitania. Schwieger was killed in action six weeks later, on September 5th 1917. Whilst being pursued by the Q-Ship HMS Stonecrop, the submerged U88 struck a British laid mine off the Frisian island of Terschelling in the North Sea. The British were quick to credit HMS Stonecrop with this "kill" as it made for good propaganda, but the mine that proved fatal to Schwieger was not laid by HMS Stonecrop at all, and she certainly had not fired upon U-88 with any effect during the chase. Walther Schwieger was seven months short of his 33rd birthday when his worst nightmare became a reality. here were no survivors from the U88, whose last recorded resting place is 53,57N - 04,55E. At the time of his death, Schwieger ranked 6th in the league table of top-scoring U-boat commanders and was therefore officially a U-boat "Ace". In May of 1918, the first boat of "Project 46" was launched. Project 46 was a class of U-Cruiser and the very first was U139, which was named "Kapitan-Leutnant Schwieger" in honour of his memory. Between 1924 and 1925, parts of U20's wreck were recovered and put on display in several locations around the world. The conning tower is today on display at Strandingsmuseum St. George, at Thorsminde, Denmark, as are one of U20's propellers and her deck gun. Thorsminde is just a little south of Vrist, which is where U20 stranded. The remainder of U20's hull, including her motors, still rests in the shallow water where she stranded, at 563500 N, 081000 E. ------------- Many thanks to Mr Sondergaard who has emailed us about an auction that took place at Christie's, South Kensington, London on Thursday, 14 May 1998. In his own words he says "On page 23 of the Christie's catalogue you will find a description af lot # 62 U-Boat 20 Bell, the submarine responsible for the torpedoing of R.M.S Lusitania". There is a large picture of the bell on the same page. Further there is an account of the bell's provenance. It was I who acquired the bell at an auction in Denmark in 1975 for a rather modest sum. In 1998 I decided to sell it ( I always felt that it was rather "spooky").At the same auction a large display model of the Cunard liner Lusitania (lot # 271) was also sold. Both lots fetched the same price. " Full range of the torpedo strike area projected by Ralf Bartzke's computer simulation. Given that the relevant witness statements all put the impact BEHIND the mast, and that there were no survivors from the Baggage Room, the range is effectively narrowed to being from frame 247 to frame 257. Lusitania Online.